Relaxed rules for obtaining Canadian citizenship will take effect on Oct. 11, Immigration, Refugees and Citizenship Minister Ahmed Hussen announced today. Relaxed rules for obtaining Canadian citizenship will take effect on Oct. 11, Immigration, Refugees and Citizenship Minister Ahmed Hussen announced Wednesday. 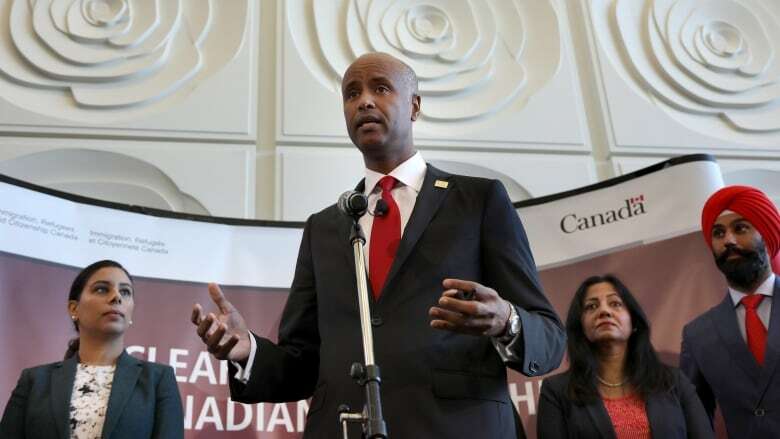 Hussen said at an event in Brampton, Ont., that the new requirements will make the path to join the "Canadian family" easier and more flexible. Hussen said today's announcement checks off a major campaign promise for the Liberals. The required duration of a physical presence in Canada is reduced to three out of five years, from four out of six years. A portion of time spent in Canada before permanent resident status will count toward residency requirements, which will give credit to temporary workers and students. The age range for language and knowledge requirements is reduced to 18 to 54 years old, from the previous requirement of 14 to 64. CBC News has reported that there was a significant drop in the number of immigrants applying to become Canadian citizens after a sharp fee increase three years ago. The processing fee jumped to $530 from $100 in 2014-15, a tripling of the previous cost when the additional $100 "right of citizenship" fee is added in. More information on the citizenship application process is on the Immigration website, and new forms will be available on Oct. 11. The changes are part of a broader overhaul of the Citizenship Act, Bill C6, which passed in the House of Commons in June.